Nusa Dua, Bali is famous for its fabulous beaches, various entertainment and all services you would need for a dream vacation. 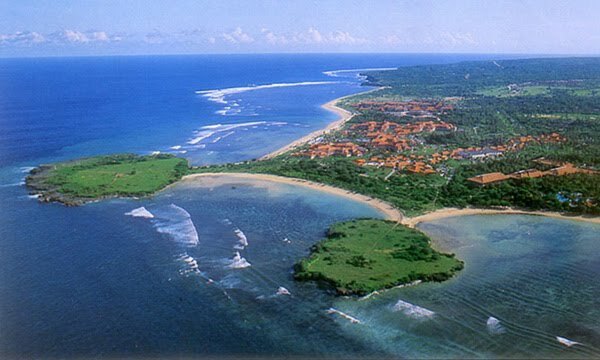 Why Nusa Dua Beach is special ? Along the coast of Nusa Dua, you can watch two beautiful scenery. The first sight is the expanse of the Indian Ocean with a charming line of horizon. With miles of golden sand stretching out in front of your feet as you first step onto the soft, warm beach, you’ll instantly fall in love with this gorgeous and laid-back area of Bali. The second landscape is a row of luxury hotels are arranged neatly along the coast. This place is one of the tourist resort area that prides Balinese society. The best hotels in this location make this attraction as one of the best hospitality in Bali. What to explore at Nusa Dua Beach? If you are a big fan of water sports, there is no doubt that the variety of interesting tourist facilities will meet your expectations. You can choose any kinds of these which can challenge your adrenalin. For example, parasailing, banana boat, snorkeling, Jet ski, water ski, wake board, fish flying, scuba dive, sea walker, and many others. The price will be determined by the kinds of facility. Geger Beach, Pasifika Museum and Serangna Island are the right choices for those who want everything goes in slow motion instead of being exhausted. In the early morning, you can walk around and see the beauty under the sea, especially you will enjoy having interaction with turtles and others reptiles in the island, then you can swim and enjoy the sunset on the beach. The remarkable art collection and some interesting exhibits from others countries found at Pasifika Museum are highly recommended. How to get to Nusa Dua Beach? Nusa Dua is located 40km south of Denpasar, the provincial capital of Bali. Access is easy from the Kuta area (20-30 minutes) and Jimbaran (15 minutes) on the main southern route called Jalan Bypass Ngurah Rai, which becomes Jalan Bypass Nusa Dua as it approaches the enclave. The international airport is about 20 to 30 minutes by car and a pre-paid taxi fare from there will cost between Rp 95,000 and 110,000. If you are staying here, then your hotel will no doubt arrange to pick you up at the airport. Public transport is far from regular in the area, but some bemos from Tegal terminal in Denpasar do ply the main bypass. In case, you should bring your own vehicle or ride a vehicle transportation tours. Public transport does not pass this area. There are plenty of hawkers selling stuff like sarong, beachware and shells. There are some really good package deals include things like massages, so you should look out for those. Lots of water sports are available like diving, parasailing,donut boat, banana boat, jet ski etc. The Public portion of the beach is dirty, the only clean parts of the beach are the private beaches which belong to the resorts. Water is clean enough to be called decent with calm, low waves. The sand is quite clean and free from edgy rocks. The beach has lots of seaweed so you can't really enjoy your swim. There is a pier to stroll to and also a little peak where you can discover a hidden temple and cliffs. The Nusa Dua beach is clean with nice sand. Wave action is not strong to disturb but crystal clear water attract you for a wonderful snorkeling close to small patchy boulders. There are places for jet ski and diving too. I enjoyed stay in the area which was warm enough for sun bating and a relax reading under umbrella. Enjoy your stay at Nusa Dua Beach.